We’ve already thought of a thousand ways to use ActionSprout, and I can’t wait to see the creative things that all our smart friends and allies are going to come up with! Second, I’m exciting to be working with Drew and Shawn. They’re fearsomely fast and creative visionaries. I’m stoked to be able to help them paint boldly on a wide-open canvas. Third, I’m excited to be working for a startup. I’ve long been nursing an entrepreneurial itch, and ActionSprout feels like the perfect way to scratch it: innovative, social-mission driven and with nonprofits as the primary customers. What’s more, Drew and Shawn are both successful startup veterans, and so I have two amazing mentors as my colleagues. I’ve still got two quarters of grad school remaining, so I’ll be part-time from now until June, then ramping up from there. I’m going to initially focus on helping our early customers get up and running, building out a partner program for strategy, campaign and social media consultants and getting done what needs doing. If you’re interested in finding out more about ActionSprout, drop me a line and I’ll give you a tour, or even better, just head on over there and check it out yourself. There’s a short video, some case studies, and best of all, you can test drive it for free. Posted on 1/11/2013 Author Jon StahlTags actionsprout6 Comments on I’m joining ActionSprout! As you can see, the email includes a personalized URL that takes me directly to a page on the Dogwood website that displays my current contact info from Dogwood’s database, and lets me update it with a single click. The information feeds back directly into the database–no data entry or cumbersome import processes are required, so it’s fast and easy both for me and for the Dogwood team. Dogwood sends an email like this a couple of times per year. In just a few seconds, their members are able to easily update their contact information. Dogwood reaps the benefits of an up-to-date supporter list and its supporters get the most relevant, personalized information possible. That sounds like a great deal to me! I’m pleased to announce the release of “Engagement Organizing,” a short whitepaper about the culture and technology of building power for social change in a networked era. I had the great pleasure of collaborating with my dear friend Matt Price, and I’m really pleased with the final results. If you are working to make progressive change in the world, please give it a read and share your thoughts with us at http://engagement-organizing.org. “The Lean Startup” — for nonprofits too! I’m most of the way through Eric Reis’ 2011 book, “The Lean Startup.” As the title suggests, it’s attempt to apply “lean” management thinking (as developed at Toyota and popularized by a thousand books and consultants) to entrepreneurial startups. But what really grapped me by the proverbial lapels was how directly most of his ideas apply to nonprofits. After all, Reis’ core definition of an entrepreneur is someone who has to manage under conditions of extreme uncertainty–or, as Ronald Heifetz might put it, people who face adaptive challenges. Reis’ solution is that leaders have to design their organizations so they can hypothesize, build, measure and learn in iterative cycles, as fast as possible. Central to this is the idea of “validated learning” — using data to confirm or falsify specific hypotheses about each element of the experiment. There’s some great discussion of how to approach experiment design and how to avoid “vanity metrics” (list size, anyone?) in favor of measurements that actually correspond to success. This perfectly corresponds with much of what I’ve been thinking and writing about lately. I can’t wait to have the opportunity to chat about it with 100 of my smartest colleagues at Web of Change. Posted on 8/26/2012 12/24/2013 Author Jon StahlTags webofchange5 Comments on “The Lean Startup” — for nonprofits too! I’m working on a fairly big chunk of writing about advocacy campaigns, organizing and strategy. (More on that very soon!) In the meantime, one idea that popped out along the way that didn’t really fit into the main thrust of the piece was the observation that, for many organizations, there’s a deep tension between building an army of passionate followers and being credible with the not-already-converted. One manifestation of this tension, with which we’re all probably familiar, is the organization that is extremely fired up but decisionmakers don’t take them seriously. More common, though, is the organization that is well positioned to be credible, but extremely weak. The creative challenge, I think, is to be both passionate and credible. Plone 4.2 has just been released. Congrats to Release Manager Eric Steele and all of the excellent folks who worked hard to make it happen! For me, this is one of the most exciting Plone releases ever, because this is the first release of Plone that includes the amazing Diazo theming system as part of the Plone core. Diazo is a simpler and smart approach to theming a website–without sacrificing creative control. Here’s how it works: Your graphic designer, who doesn’t need to know anything about Plone, builds you a theme consisting of one or more HTML + CSS templates. Plone emits its HTML pages, known as the “content.” Diazo then lets you merge bits and pieces of Plone’s HTML content into your theme’s HTML and CSS template. Diazo’s merging behavior is governed by a simple text-based rules file consisting of simple directives such as <append>, <replace> and <drop>. It’s a drop-dead simple syntax that anyone can master, and it doesn’t require you to understand anything about how Plone works–basic HTML and CSS literacy is all you need. I’m intrigued, tell me more. Diazo does its magic by building on top of XSLT (eXtenstible Stylesheet Language Transformations), a standard originally developed in the late ’90s that defines a language for transforming XML documents into other XML documents. (HTML pages are one kind of XML document.) Raw XSLT is too generalized and too complex for everyday use as a everyday website theming technology, so Diazo provides a simple and user-friendly set of basic rules that get compiled into XSLT behind the scenes. If you’re already an XSLT wizard, you can use the full power of XSLT expressions in your Diazo rules files, but most folks will never need or want to do this. Plone 4.2 comes pre-configured for Diazo (via plone.app.theming), so if you’re using Plone, you don’t have to lift a finger. If you are using Plone alongside other web applications, or not using Plone at all, most modern webservers already have support for XSLT transformations, so deploying Diazo via WSGI, Ngnix, Varnish or Apache is simple and straightforward. Diazo’s been around for a while, and it’s been battle tested in production as an add-on product for several years now. It’s ready for prime-time. There are already a couple dozen Diazo-powered Plone themes available for download, and I’m expecting to see lots more as Diazo becomes “mainstream best practice.” It’s pretty easy to take any generic open-source HTML/CSS website theme and adapt it for Diazo. So, if you need to make a Plone website look beautiful, Diazo is all you need. If you need to fundamentally change what content Plone is emitting in the first place, then you’ll need to dive into Plone customization. Diazo doesn’t completely replace all of the customization that you might to do Plone, but it narrows the scope of what you need to do inside of Plone quite a bit. If you’ve got a vivid imagination, you might already be thinking, “OK, simple text-based rules files are cool, but what about a graphical editor for building themes?” Well, that’s in the pipeline. Martin Aspeli is putting the finishing touches on a version of plone.app.theming that includes a graphical editor for Diazo rules files. This is currently slated to ship with Plone 4.3, and will make it point-and-click easy to build or modify Diazo theme rules. I’m really excited about Diazo. It’s the fulfillment of a vision for “rules-based theming” that’s been percolating in the Plone and Python communities for a number of years now, starting with Paul Everitt’s original implementation of Deliverance way back in 2008. It was a radical idea then, and it’s still cutting-edge now. 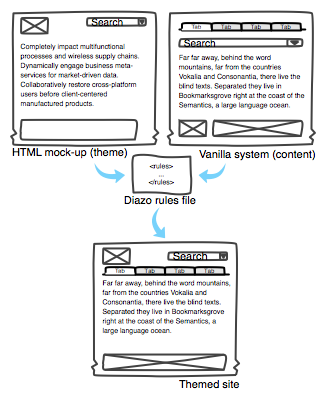 Diazo brings rules based theming into the mainstream, both for Plone and for other web applications. I think we’re going to look back a few years from now and wonder why we ever themed websites any other way. Point /Counterpoint: Is Philanthropy Engaging in Magical Thinking? – NPQ – Nonprofit Quarterly – Promoting an active an engaged democracy. WorldChanging Seattle: Incentive Zoning: A Good Plan For Affordable Housing? Periodically, I trawl through the Plone Collective repository (both via Github and via PyPi) to see what folks are building but not publicizing widely via Plone.org. As usual, I found some hidden gems that I think deserve a bit wider attention. Fair warning: I’ve tested each of these products in a Plone 4.1.5 development instance, but I’ve not deployed any in production or reviewed the code. All are written by experienced Plone community members, though, so they should be at least reasonable sane. I’d love to hear about your experiences with any of them. Plone’s default folder view shows items in the order they were added, and while you can manually rearrange items, there’s no way to automatically resort items in a folder view. (Although you can add a collection as the default view of a folder, this is not always obvious to new users, and quite a few clicks.) With collective.folderorder, you get a new “Order” option the Actions menu for a folder, and you can easily choose from several default folder ordering schemes, including: reverse order, unordered, and partial ordering. Even better, it provides an easy way for developers to add new ordering schemes. I’d love to see this one PLIPed for future inclusion in Plone, possibly with a few more ordering options (e.g. last modified, creation date). It’s a small but welcome UI affordance. Another small but welcome improvement to folder ordering. This one adds a nice little set of buttons below a folder listing that allows you to move items instantly to the top, the bottom or up/down a designated number of slots. Again, super convenient when you need to rearrange a lot of folder items. collective.prettydate reformats the display absolute dates/times (e.g. 3/1/2012) to relative date (e.g. one month ago, four days ago, etc.) This is really nice for news sites or sites with upcoming events. collective.embedly makes it stupidly simple to embed almost any externally hosted multimedia (YouTube, Vimeo, Slideshare.net, etc.) into Plone. It uses the fantastic service “Embedly” which is itself built on the open “oembed” standard. Developers who want a bit more power may also want to look at collective.oembed. This one is a bit conceptual, but pretty awesome. From the prolific and talented Nathan Van Gheem comes collective.routes, which makes it possible to build URLs in Plone that do catalog queries, e.g. http://mysite.com/blog/date/of/blog/post. This isn’t really an end-user product, but it makes it easy for integrators to build really nice URLs for their custom Plone apps. I’m reading an interesting short essay by John Gaventa, in which he talks about three different forms of power: visible, invisible and hidden. Visible power is the power that plays out in formal decisionmaking processes. Social change activists participate in this through lobbying, advocacy, organizing, etc. Hidden power is the power to set the agenda, include or exclude certain participants, etc. This kind of power is often exercised behind closed doors. Invisible power “involves the ways in which awareness of one’s rights and interests are hidden through the adoption of dominating ideologies, values and forms of behavior by relatively powerless groups themselves.” In other words, invisible power is the creation of culture, beliefs and awareness. Also true for nonprofits. Note interesting $2M/20 people threshold. Why Are Promotions Less Likely in Nonprofit Firms? Study suggests that nonprofits have less need to use promotions as a reward and can concentrate on using them to achieve job fit. I can’t quite nail the analogy, but it seems to me that if you took this article, replaced “startup” with “nonprofit” and tweaked the context a bit, it would make for an interesting conversation about the nonprofit sector. The short version might go something like this: as in the tech startup industry, there are too many nonprofits chasing too little top-flight talent. They can’t compete on cash. </analogy ends> So instead they just don’t really compete at all. Riffing on Marty’s recent post about the ever-lower cost of advocacy group formation… it is true that it is cheaper than ever to start an advocacy organization. As Clay Shirky observed, that is the real power of the internet, it lowers the cost of finding like-minded people. However, I think the paradox is that as the cost of forming a group declines, more groups are formed, which actually tends to increase the cost of achieving social change campaign goals. Why? So many organizations competing for limited dollars, limited talent, limited attention, press coverage, etc. This means you have to be better than ever to punch through the noise and achieve critical mass. Most of the rewards go to the top 1%. This is not about scarcity vs. abundance, it’s recognizing that public agendas can only have so many items on them at once. Still sorting through the implications of this. I do think Marty is right that we need to come up with new approaches to dealing with this fragmentation.